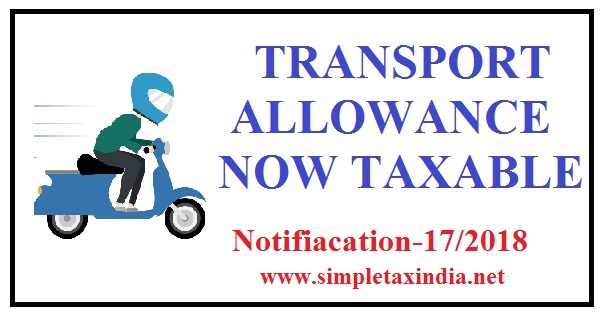 Transport Allowance is paid to employee for travelling between Home to Office and back by whatever name is given be employer.This allowance was exempted from income tax up to the extended it is used for specified purpose subject to maximum limit of Rs 1600 per month up to Financial year 2017-18.The enhanced limit of Rs 3200 per month applicable for disabled employee. In Budget 2018 , This exemption has been proposed to be deleted and in place of this exemption Standard deduction of Rs 40000/- introduced with effect from Financial year 2018-19.Further Medical reimbursement exemption of Rs 15000/- is also subsumed in above standard deduction. It is worthwhile to mention here that transport allowance exemption will continue to be available to disabled employee in Fy 2018-19 onward. No change has been made for disabled employees. So they can claim both standard deduction as well as transport allowance exemption. Notification in this regard reproduced hereunder. [Notification No. 17/2018/F. No.370142/02/2018-TPL] PRAVIN RAWAL, Dir. (TPL-II) Note : The principal rules were published in the Gazette of India vide notification No. S.O. 969(E), dated the 26th March, 1962, and was last amended by vide notification number G.S.R. 332(E) dated 03/04/2018.